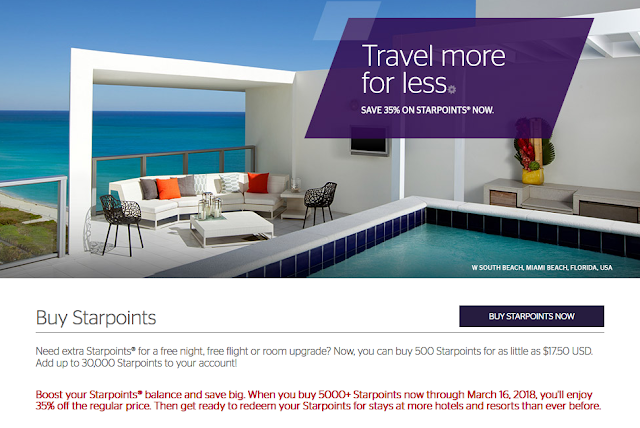 Starwood is once again offering of a 35% discount when you buy Starpoints. This is always an ideal buy points offer as you can pull way more value out of the points when redeeming for expensive hotels or converting to airline miles for under US 2 cents apiece. Your yearly limit remains at 30,000 Starpoints and even if you took advantage of this same offer back in December your account should have been reset to be able to buy again.. This offer brings the price down to US 2.28 cents each or just above 1.82 cents per airline mile if you take advantage of SPG's 5,000 mile bonus when converting 20,000 Starpoints at a time. Remember you can convert SPG Starpoints to Marriott Rewards at 1 to 3 rate which means purchasing 30,000 Starpoints is like buying 90,000 Marriott Rewards points.